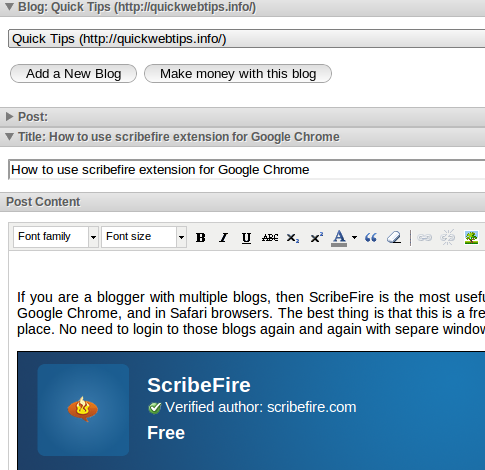 If you are a blogger with multiple blogs, then ScribeFire is the most useful tool for you. The scribefire tool is available as a browser extension or add-on. You can use ScribeFire in Firefox, Google Chrome, and in Safari browsers. The best thing is that this is a free service. After installing Scribe fire, you can add multiple blogs into it and can post to those multiple blogs from one place. No need to login to those blogs again and again with separe windows. This magic tool helps you to post to all your blogs from one place. How to Use ScribeFire for Chrome? After the installation complets, you can find the scribeFire icon on the menubar of your browser. Also it will show you a small notification. Click on that icon. The new window of ScribeFire will open. This is the place wher you can manage all your blogs. Click on the button “Add a New Blog“. Find the button on the upper left corner. Put the URL of your blog in the URL field. (like :http://quickwebtips.info). This will take few seconds to detect the information about your blog.If you are using a WordPress Blog, it will detect that and ask you for the login credentials. Put the username and password. Click on the “Finish” Tab. If Scribefire shows an error message like “XML-RPC services are disabled on this site”, you need to enable it by going to the admin panel of your wordpress blog. Inside the admin dashboard, find the “Settings” option on the left panel and click on the writting option. Inside the writing settings, scroll to the “Remote Publishing” section and Enable XML-RPC publishing protocol by putting the check mark. Then click the “Save Changes” button. Return to the ScribeFire dashboard and try again to login. I am sure you will be able to enter. If look at the editors it looks similar as the editor in your blog. You can write the posts here and publish them easily. You can add more blogs into this tool and will be able to save your valuable time.